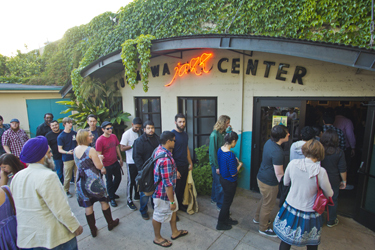 A capacity crowd attended the event at Kuumbwa Jazz Center in downtown Santa Cruz. 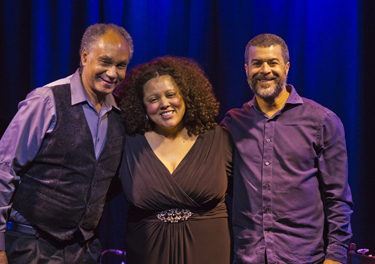 Prior to the performance, the panelists discussed the global historical role of jazz in race, class, and culture. 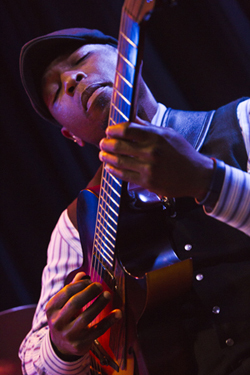 Guitarist Terrence Brewer takes a solo. UCSC humanities dean Tyler Stovall fields a question from the audience. Kim Nalley and her band. 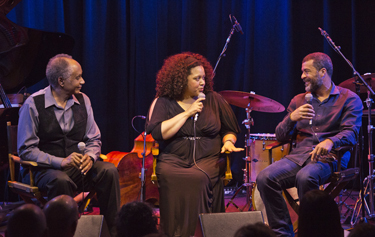 A capacity crowd filled Kuumbwa Jazz Center Saturday night for Race, Class, and Culture through the Lens of Jazz--a special event presented by the UC Santa Cruz Humanities Division, featuring a panel of jazz scholars, followed by an inspired performance by Bay Area jazz singer Kim Nalley. 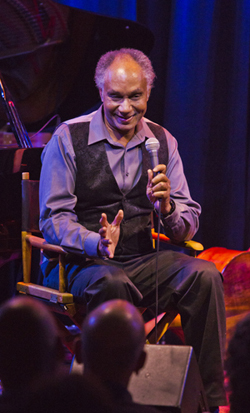 The occasion was both a celebration of UNESCO’s International Jazz Day and UCSC’s annual alumni weekend. The evening began with a conversation about the global historical role of jazz in race, class, and culture, featuring humanities dean Tyler Stovall, history professor Eric Porter and jazz singer/historian Kim Nalley. They talked about the African American roots of jazz and moved on to the political nature of the art form. 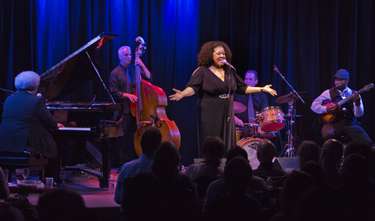 “Not following the notes as written is also political,“ added Nalley, who in addition to her burgeoning singing career is now pursuing a Ph.D. at UC Berkeley (her dissertation is titled “GI Jazz”). One audience member asked how to get jazz greater exposure beyond the elite. But Nalley questioned the assumption. “There’s a lot of great music in poorer neighborhoods where a lot of white people won’t go, so they just don’t know about it,” she responded. “But she ultimately agreed with Porter, who pointed out that jazz needs to be taught in the schools. “Its one of those essential things that will continue to build this art form,” he noted. After the panel, Nalley deftly switched roles from historian to jazz headliner. She opened the show with a stunning version of “Summertime,” performing with no microphone and backed only by her acoustic pianist. From jazz ballads to gospel to rhythm and blues, Nalley had total command of the crowd, backed by piano, standup bass, guitar, and drums. “I think a lot of black women and black people in general like to honor and archive their ancestors and I continue to do that in my music,” Nalley observed.